There are many websites and online tools for technical analysis of Indian stocks. But when it comes to Fundalmental analysis of stocks using Stock screeners, there aren't much available. There is some good news for Investors who want to analyze Indian stocks using fundamental ratios and stock screener. 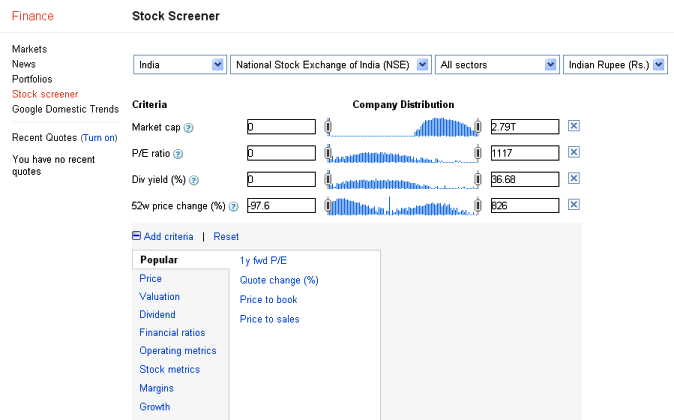 Google Finance now provides excellent stock screener for online analysis of Indian stocks. Investors can now filter stocks using the stock screener, based on the criteria like Market cap, P/E ratio, Dividend yields etc. Also, there are more options to choose from and one can filter stocks using different criteria available like -Financial ratios, Operating metrics, Growth rates and Margins.